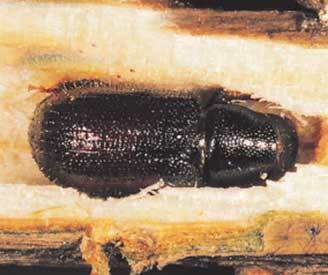 Also referred to as PSB, bark or engraver beetle. Adults vary in color between reddish brown and black. About 3-5mm long, cylindrical bodies. Larvae are white with brown heads, up to 5 mm long. One year life cycle. First found in Ohio in 1992; originally from Europe. 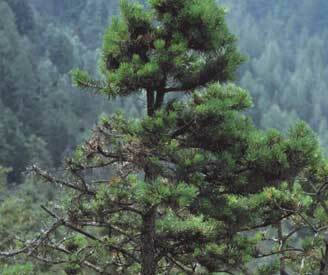 Spreads through the movement of nursery stock and pine wood products. Wilting on new branch shoots from burrowing adults. Stunted tree growth. 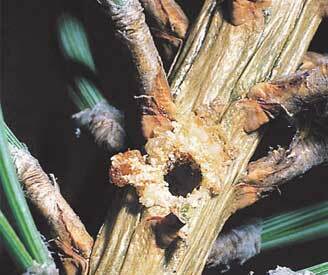 Larval feeding galleries throughout the trees. No known infestations in Nebraska. Currently found in several Northeast and Midwest states in the U.S., including nearby states of Iowa and Minnesota.